Crowded Croft started off in 2003 as a duo combining the talents of Helensburgh lads Andy Clark and Alasdair Allan on guitar and fiddle. A year later, another Helensburger, drummer Andy Bruce, joined the band. 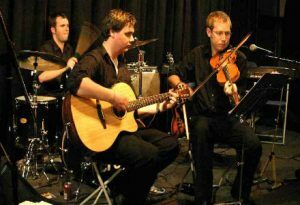 The band quickly built up a reputation as an in-demand ceilidh act with a modern sound, ideal for parties and weddings. In 2006 Crowded Croft branched out and enlisted vocalist and bassist Stuart Cowan to transform the group into a splendid 4 piece covers band. This turned the band into a rare breed of ceilidh group that could effortlessly cover pop, rock and jazz. Crowded Croft have played all over Scotland over the last ten years and have also played as far afield as Bergen and Gothenburg. The band has played at more wedding receptions than they can count, and although they can’t count very well, it’s still a lot of weddings. “We’ve always been lucky, and played to warm, appreciative audiences who have danced to our music and bought us the occasional drink. And if you have a good bunch of guests, you’re 90% of the way to a fantastic reception. Choosing the musical entertainment for your wedding reception can be a tricky business. Knowing your guests, and what will get them dancing, is vital. Let us know your special musical requests and we’ll do our best to learn them up. Balance is important. We’ll happily play ceilidh tunes from the beginning until the end of the night, but some of your guests may wish to cut some rug to Mustang Sally or Suspicious Minds. This is why we employ the services of a singer and bass player, allowing us to morph effortlessly from a ceilidh band into a rock and pop covers band. We find that ceilidh dances work best early in the evening, allowing guests to mix and interact, while pop music seems more appropriate a little later, after strong drink has been taken and inhibitions are forgotten, although we usually end the evening with an Orcadian Strip the Willow. [ut_button color=”theme-btn” target=”_self” link=”#contact-section” class=”book-today-btn” size=”medium” ]BOOK TODAY!